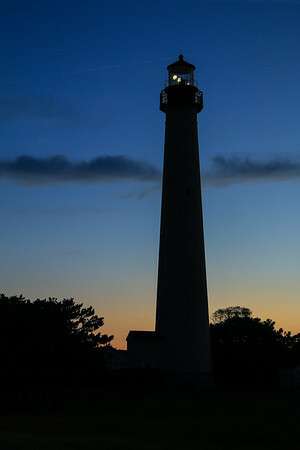 The Cape May Lighthouse is located in New Jersey at the tip of Cape May, in Cape May Point State Park. It was built in 1859 under the supervision of U.S. Army engineer William F. Raynolds, was automated in 1946, and continues operation to this day. There are 199 steps to the top of the Lighthouse. The view from the top extends to Cape May City and Wildwood to the north, Cape May Point to the south, and, on a clear day, Cape Henlopen, Delaware, to the west. The lighthouse is owned by the state of New Jersey after ownership was transferred from the Coast Guard in 1992. The tower is 157 feet 6 inches tall, from the ground to the tower's cast iron spiral staircase. There are 217 steps from the ground to the top, with 199 steps in the tower's cast iron spiral staircase. The lighthouse has two separate walls. The outside wall is cone-shaped, and is 3 feet 10 inches thick at the bottom, and 1 foot 6 inches thick at the top. The inside wall is a cylinder with 8.5-inch-thick walls which support the spiral staircase. The walls were designed to withstand winds several times above hurricane force.